Little packages from far away, faithfully delivered by Her Majesties postal service, are one life’s simple pleasures. This blog has put me in touch in with new friends in far away places and it’s always great to receive a little surprise package from one of them. 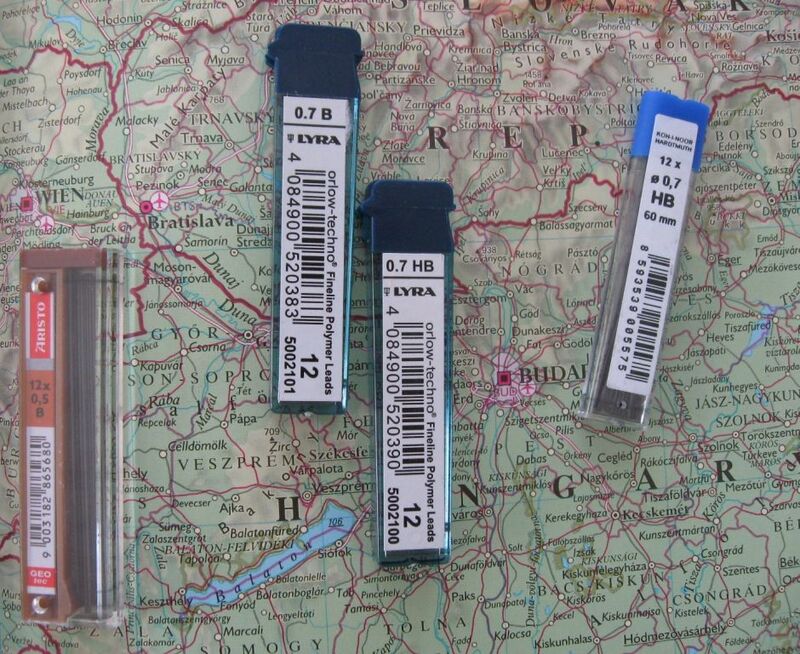 The other day my first ever parcel from Hungary arrived. Nick from Hungary had done a little pencil shopping on one of his jaunts to Vienna, Austria with a stop-off in Bratislava, Slovakia. Some new mechanical pencil lead refills to add to the collection. 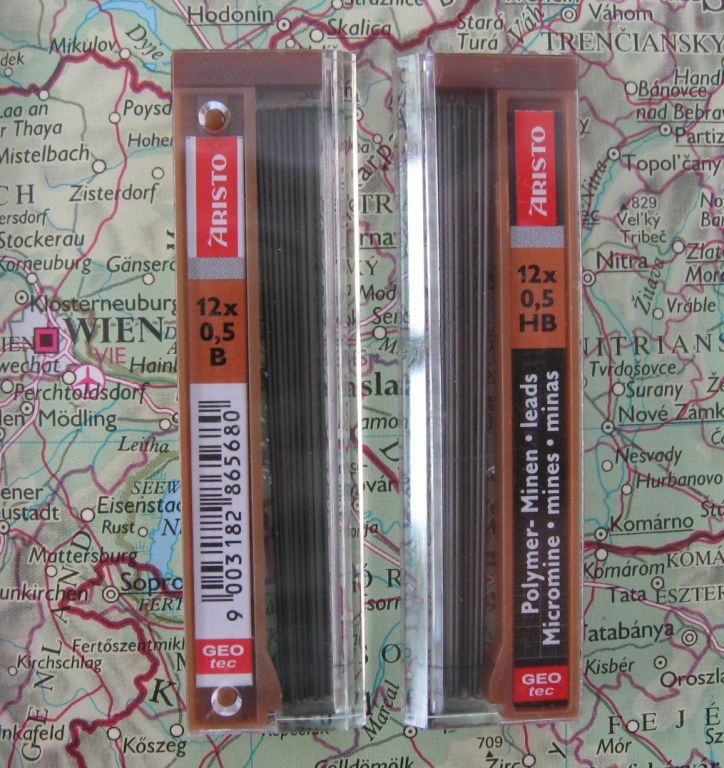 Aristo, an Austrian manufacturer and distributor of drafting supplies. Apparently the company roots are German, and in 1976 the company was acquired by Rotring, but then the Austrian subsidiary developed relative independence and more recently local management staged a buyout leading to full separation from Rotring. Lyra, from Germany, now part of the Italian FILA group. 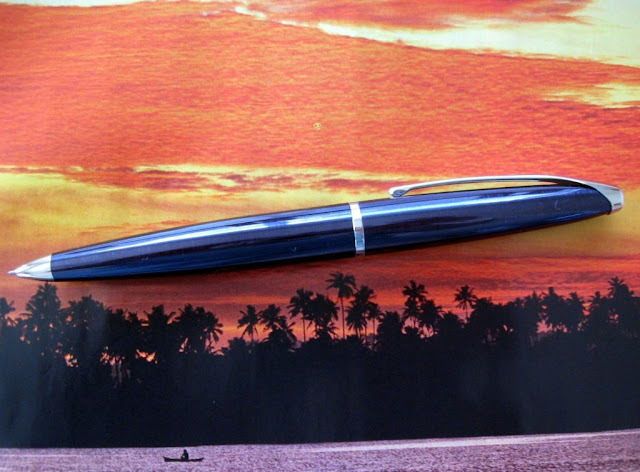 Lastly from the Czech Republic, Koh-I-Noor. Ahhhh…the Czech Republic, the birthplace of pilsner. At the same time as Nicks package arrived, the travel section of my weekly magazine was extolling the virtues of ‘Beer Wellness Land’ in the Czech Republic. 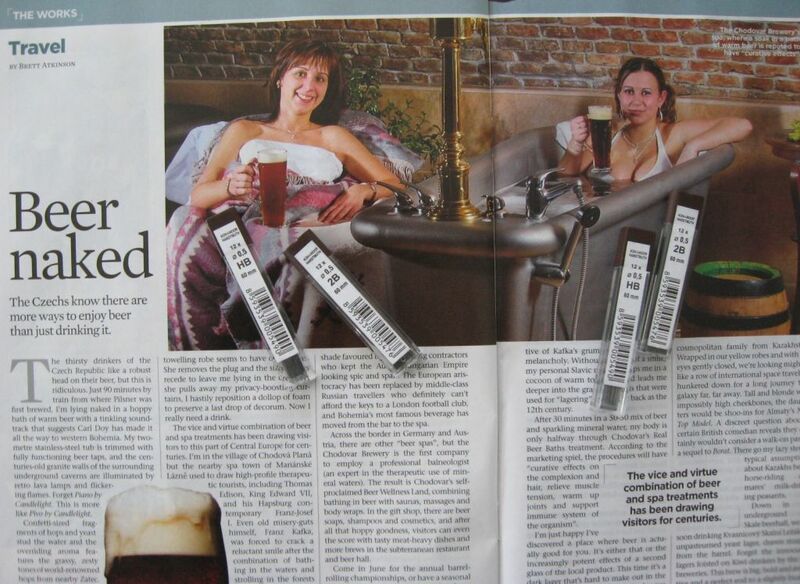 A brewery and spa, where you soak in warm foamy hoppy goodness! Now that would be a good days outing – KIN factory tour in the morning, then an hour or so in the car and a relaxing spa in the afternoon! Many of you will have read elsewhere of the recent closure of Staedtler Australia’s manufacturing operation. They didn’t make any mechanical pencils, but I always liked to see “Australia” on the woodcase pencils in the local shops. It made a welcome change from the usual other countries like China, Indonesia, etc. So, with that in mind I thought I should say “Farewell, Skippy. I’ll miss you” especially to the Staedtler Tradition, formerly proudly Made in Australia. 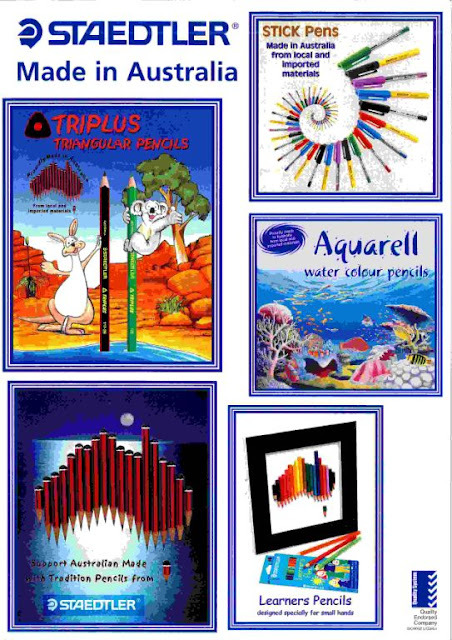 Dating from 2001, here’s the front page of a 4 page A4 brochure detailing the pencils, coloured pencils and stick ballpoints they made in Australia back then. I don’t usually write direct comparisons of mechanical pencils in the “Mechanical Pencil A v Mechanical Pencil B” style, but quite a few people ask those sort of questions, so I have decided to do this comparison of two mechanical pencils that are always close at hand when I have something to write. 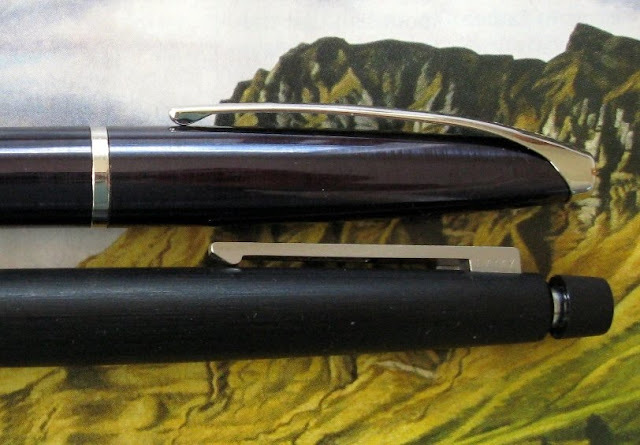 Lamy 2000 compared to Lamy Sribble. Note that I am comparing 2000 to the Scribble 0.7mm mechanical pencil which has several differences to the Scribble 3.15mm clutch pencil. 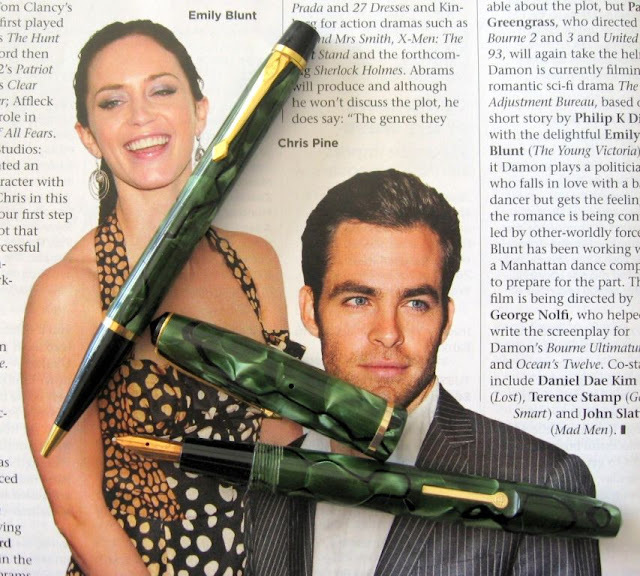 The 2000 is a long tapering classic minimalist style mechanical pencil. Scribble is somewhat more unusually shaped. This photo hopefully demonstrates the difference in length and width between the two. Weighing in at 19g, 2000 is 138mm long by 12mm diameter whilst Scribble weighs in at 25g and is 120mm long by 14mm diameter. Not surprisingly this difference in weight and dimension produces a substantially different feel in the hand. 2000 looks and feels long, slender, lightweight and precise versus the short, solid, robust, chunky heavyweight Scribble. 2000 has a brushed surface finish which gives a very pleasing tactile experience in the hand. This finish provides good grip and over the long term some patina from use may build up. Scribble has a lightly sandblasted type finish which also gives reasonable grip but doesn’t feel as interesting to the fingers. 2000 has a fixed conical sleeve. It is still a reasonably fine diameter at the point and I would describe it as only semi-pocket safe. On the other hand Scribble has a short retractable metal pipe sleeve. When retracted Scribble is considerably more pocket safe than 2000. 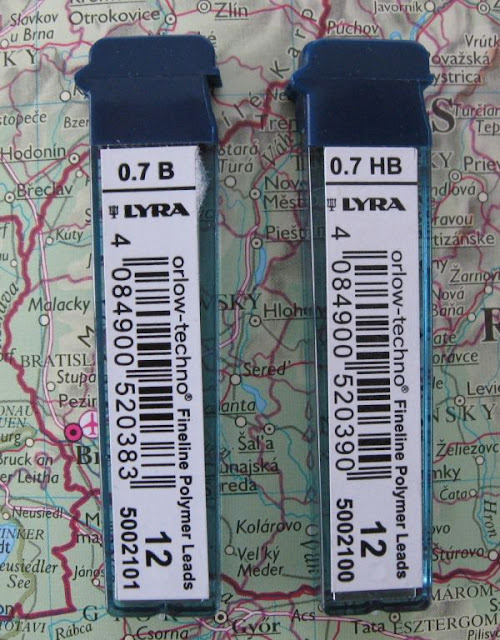 Both are normal push top button ratchet advance mechanisms, but they produce an unusually long length of lead. Ten clicks on 2000 will get you a whopping great 11mm of 0.5mm lead. On the other hand ten clicks on Scribble will get you 9mm of 0.7mm lead - that’s actually still quite a bit, despite being a shorter advance than 2000. Some recent comments on this blog have noted lead breakage problems with 2000. I definitely agree that 2000 takes some getting used to, and until you do so, you may have lead breakage problems. I personally believe most of the problems are associated with the unusual length of lead advanced by the mechanism. When you first start writing, two clicks of 0.5mm lead is way too much and you will probably snap it. You also need to get used to allowing the lead to wear right down before advancing another length. Lead breakages will also be reduced if you adopt a fairly upright stance when writing, and use superior quality leads. If you are happy writing with either 0.5mm or 0.7mm lead, and want a 2000, then I’d definitely recommend you choose the 0.7mm for improved resistance to breakages. The black coating on the push top button of my Scribble has worn and scratched over the years through wear against the main body. Both have small erasers under the top cap, and neither are worth further mention. Both also have clean out rods under the eraser which is nice little extra. Both have strong functional metal pocket clips. 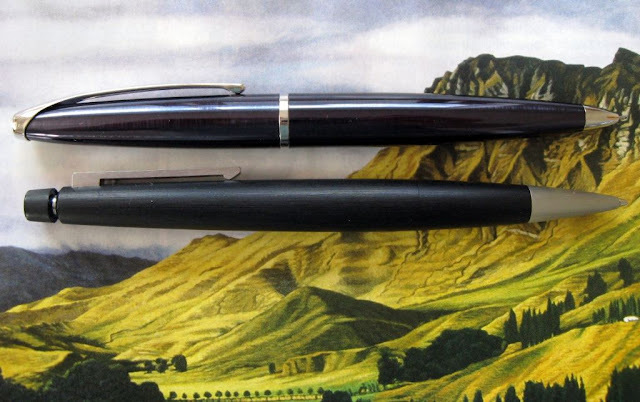 Both these mechanical pencils are great things, but Lamy clearly intend these two mechanical pencils to occupy different niches - 2000 is a 'fine writing instrument' and all that implies. Scribble is no lesser a testament to Lamys design ethic, but it is a note-taker, a jotter, a sketcher. 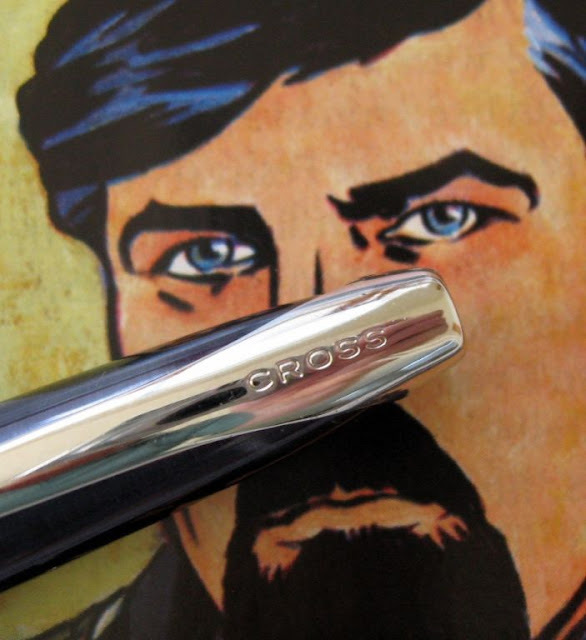 The Cross ATX mechanical pencil appeals to my personal tastes. The body is a gently tapering shape and the pocket clip flows onto the body, continuing the smooth elegant lines. Classical simplicity. Mighty attractive. 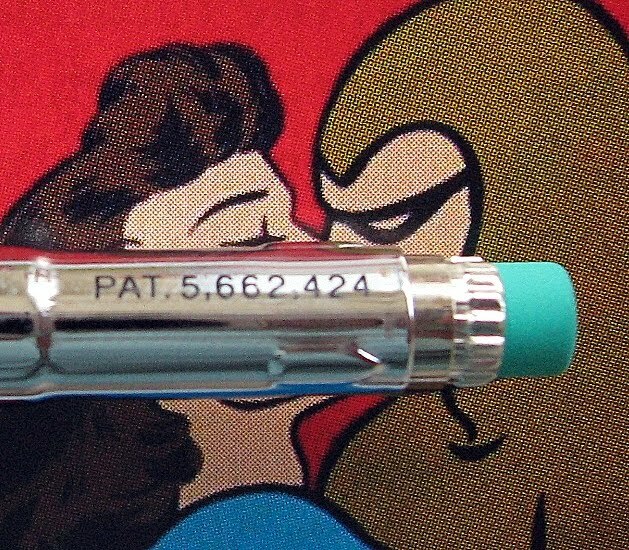 My ATX mechanical pencil is the cyanic blue with chrome trims colour option. The cyanic blue is a very dark shiny blue lacquer type finish which shows many fine striations when the light hits it in a certain direction. Apparently this is actually reflections from the brushed metal finish of the main body beneath the lacquer. The ATX is a reasonably substantially sized writing instrument, but at 25 grams and with a fairly central balance point, it is somewhat lighter in the hand than its size and dark colouring might otherwise suggest. Down in the general area where most would grip the pencil the diameter is about 8 – 10mm. The lacquer finish is smooth and shiny, but as far as such finishes go, and combined with the reasonable body diameter, it provides an acceptable level of grip. The lead advance mechanism is twist top ratchet. The top half of the body is rotated to activate the lead advance one increment and then it springs back. If you have good dexterity then you can operate it one handed, but many would need to use both hands. There is quite a bit of rotation before the lead advance mechanism is engaged which means there is an amount of play between the two halves of the pencil and at times there is some intermittent wobble noise when writing with the pencil. Ten activations of the mechanism will advance about 6mm of the 0.5mm lead. 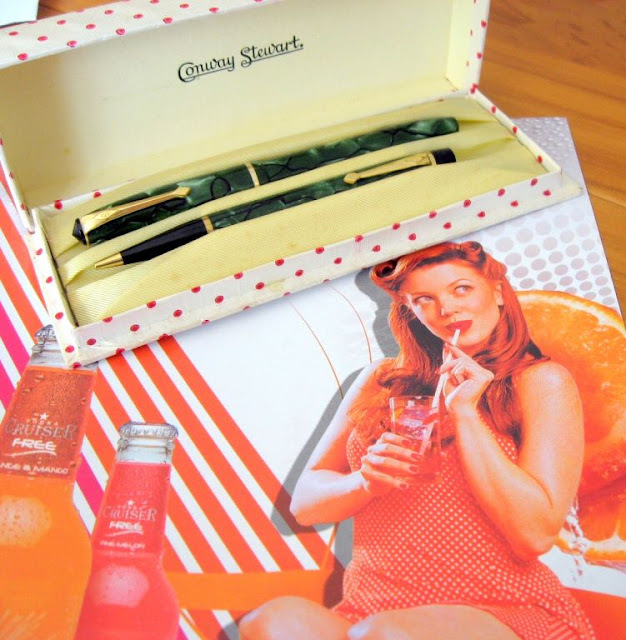 The lead sleeve is a short 2mm long pipe and it is a fully retractable sliding sleeve so the pencil as fully pocket safe as you would expect from a luxury writing pencil. If you twist the top half of the body the opposite direction than that which advances the lead, then the twist mechanism locks and the lead and sleeve can be pushed back into the body. 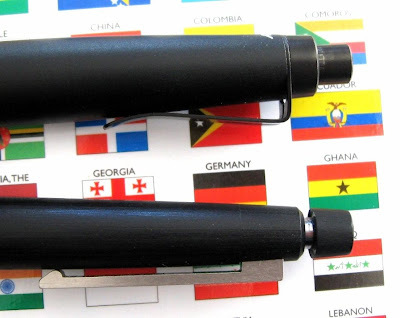 This twist and lock feature of Cross mechanical pencils was pointed out to me by a commenter on this blog earlier this year. Just like push top ratchet mechanisms you can of course also push the lead and sleeve back into the body when the mechanism is at held twisted at its maximum lead advance position. The top half of the body pulls off to reveal a small eraser, which in turn pulls out to allow access to the lead refill chamber. The mechanism housing is clearly marked “PAT. 5,662,424”. Now, if you look that up on Google Patents, you will see that it is for a “ ‘Mechanical Pencil’ Assignee A. T. Cross Company, Lincoln, R.I. Inventors Kageyama Shuhei; Ebinuma Tadayoshi, both of Saitama-ken, Japan; Thomas Clem, Lincoln, R.I.” Now, those first two names and their address didn’t exactly fit with A. T. Cross and it piqued my interest. This patent lists two other patents in its citations section, so I thought I’d follow through to them. 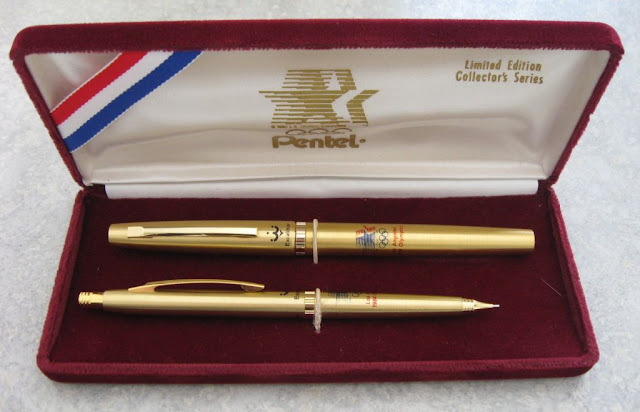 The first of these is “ ‘Rotary knock type mechanical pencil’ Inventors: Hidehei Kageyama, Robert V. Lozeau Assignees: Kotobuki & Co., Ltd., A. T. Cross Company” Ahhh, Kotobuki, now there’s an interesting relationship revealed. Anyway, I won’t rush off on that tangent any further…for the moment. “CROSS” is marked clearly on the pocket clip. The pocket clip is strong and will certainly keep your pencil attached to whatever you clip it to. It’s very hard to see, but “CROSS” is also marked on the top half of the body, near the centre ring. My ATX pencil was purchased a few years old and it states on the protective packaging sleeve “Assembled in USA with US and foreign components”. 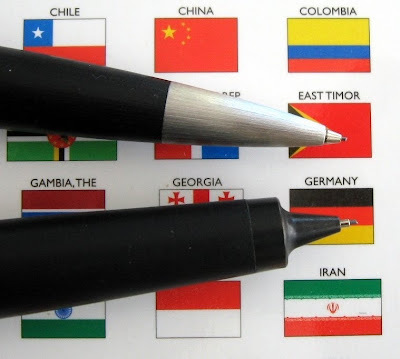 I don’t know what country of origin statement is on the mechanical pencils currently shipping from the A.T. Cross company distribution centre. • Best Points – The looks. • Not So Good Points – That occasional rattle noise can be annoying. Dimensions – Length 141mm, diameter 12mm at widest point. Balance point about 75mm up from the tip. Back on 9 September, ‘Benjamin’ left a comment on this blog suggesting I review the Cross ATX mechanical pencil, and also compare it to the Lamy 2000. Now, I don’t normally do that sort of comparison thing, but without establishing a precedent…here are a couple of photos of the Cross ATX and Lamy 2000 so you can get more of a direct comparison between the two. 18 grams for 2000, 25g for ATX. Clips - sprung and not sprung. Back on 8 September 2009, ‘Guacanator’ left this comment on my Guestbook. "My question is in regards to the Excalibur. You've mentioned it, and have compared a few other pencils to it. However, I feel it has not been adequately explained. I've done searched for it, but all I found was people bragging about their collections. Do you think you could put in a bit of info about it?" I thought he (or she) had a fair point, but there was someone far better equipped to handle this than me, so I fired off an email to Germ of Pencils11 blog. Germ took up the challenge and has published his article, so head on over there. One of these has had 25+ years of use and one hasn’t - Excalibur and SG65 gold + black stripe. At the risk of being called a skite, look what I just scored…it’s like eye-candy from yesteryear. 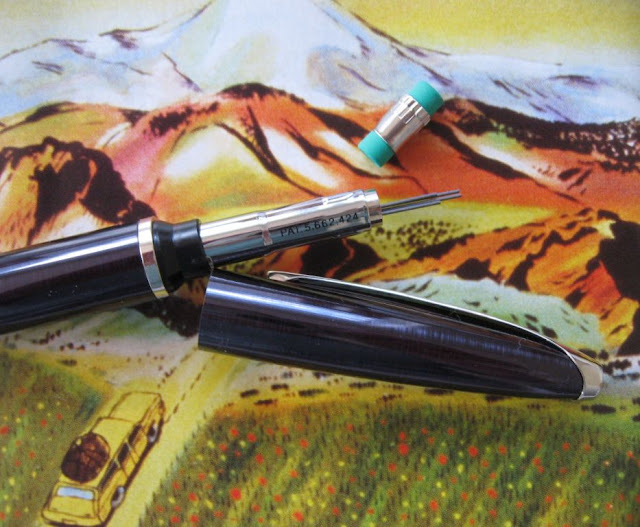 During the current tough economic times I have been amazed at how the prices of local auctions for vintage fountain pens and pencils have held up, and even increased. A luxury asset increasing in value during recession? Still, everything comes to he who waits. I’ve refused to buy into the current price scenario and lost auction after auction for over a year, and then just last week, somehow the other bidders were absent, and for the price of a home delivery pizza I got this. Beautiful. 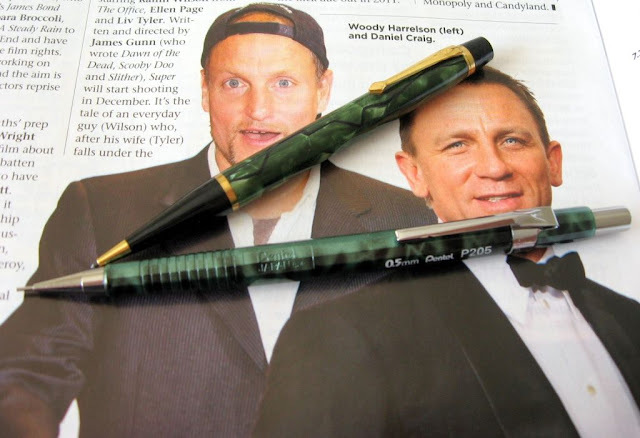 I have previously blogged about these two writing instruments – the Conway Stewart No 15 fountain pen and Nippy No 3 propelling pencil, in green marble with black veins. In the past I’ve paid nearly three times as much for these sets. Even better, unlike most sets, this latest one is in fantastic condition. It’s probably forty or fifty years old and it might not be NOS, but it’s so close you really do need a magnifying glass to find any blemishes. 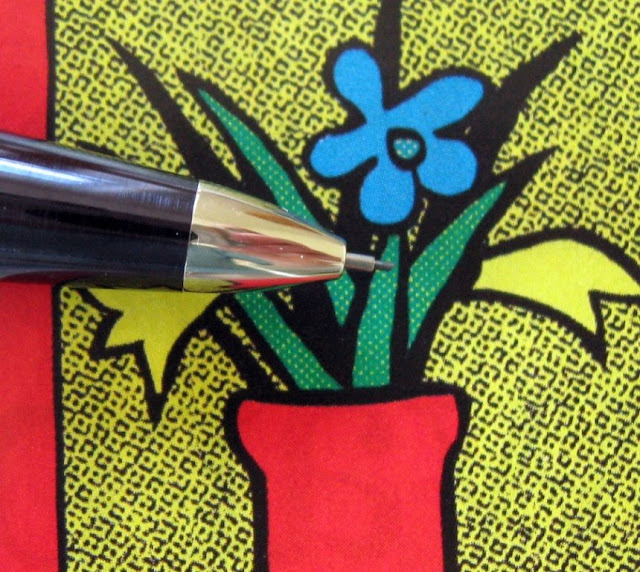 The tip of the fountain pen nib shows no sign of any wear under examination with a 10X magnifier. Bright and shiny gold fittings - there’s no brass here. Lustrous marble. True depth of colour. Talk about the cat’s pyjamas, the bee’s knees. Recently I posted about the Pentel P205M Limited Edition marble pencil. No contest. I include this closing note because spell check didn’t like that word up at the beginning. I had no idea it was Australasian only. • verb 1 Austral./NZ boast. 2 Scottish & dialect move or glance off quickly and forcefully. • noun Austral./NZ 1 a boaster. 2 boasting or boastfulness. The Fourth Carnival of Pen, Pencil, and Paper is now up at Black Belt Productivity. Lots of posts and reviews on pens, notebooks, and more, but sadly only one pencil review, namely my review of the Rotring Tikky mechanical pencil. Find out more about the carnival, including how to submit a post, at Notebook Stories.